I love fajitas, they might be my favorite dinner - it's hard to narrow it down to one favorite dinner but Mexican food is definitely my favorite and I always get fajitas. 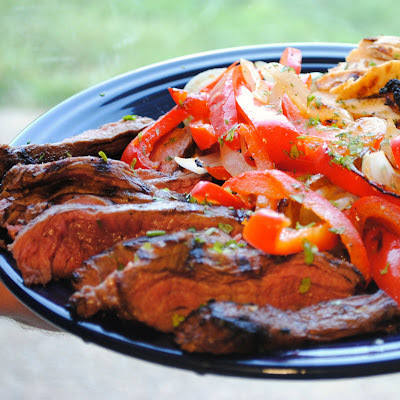 While I prefer chicken fajitas, my husband loves steak and I rarely make it for a couple of reasons - because I'm not a big red meat fan and because it's generally expensive. 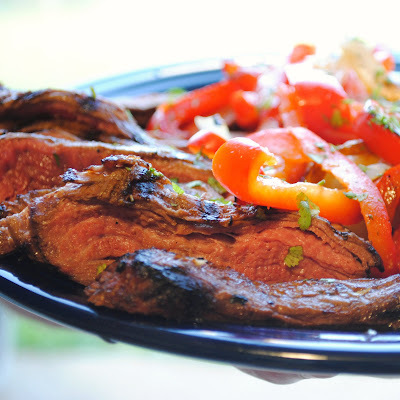 Flank steak is one of the more affordable types of steak and making it into fajitas really allows you to stretch your dollar even a little further. 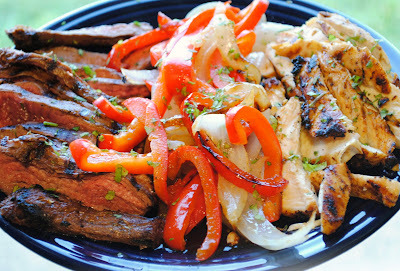 Make chicken and steak fajitas like I did here and you can really cut back the cost. This whole plate of food consists of half of a flank steak and one chicken breast and was enough for both of us with enough leftovers for a second meal. For the chicken, I use the marinade from this recipe. Tortillas and any desired toppings for serving. Combine all ingredients except steak and cilantro in a large Ziploc bag, mix well and add steak. Refrigerate for approximately one hour. Preheat grill to medium high heat and remove steak from refrigerator to come to room temperature while grill preheats. If you add steak to the grill straight the from the refrigerator, it will make the meat tougher. While grill preheats, slice bell peppers and onions into long thin strips. Lay out a large square of foil, add vegetables to the center, sprinkle with garlic salt, cumin and chili powder and squeeze lime juice over the top. Toss to coat the vegetables and fold foil around the vegetables to make a foil packet. Add steak (and chicken if you are making both) to the grill. Cook steak directly over medium high heat to sear the outside for about five minutes per side, move to a cooler part of the grill and cook as desired, approximately another three to five minutes for medium. Cook vegetables over medium heat for about ten minutes until tender. Warm tortillas on grill over indirect heat. Let steak rest, covered with foil for an additional five minutes before slicing. Slice thinly, top with cilantro and serve. I made these fajitas for dinner tonight and I am IN LOVE. They were simple and delicious! They didn't need anything added, so they were healthy too! I love your recipes, thanks for sharing them with the blogging world! @Meghan - so glad you enjoyed them! Use a combination of regular chip powder, cayenne and cumin and just season to taste. Ancho chili powder is a bit more intense and smoky so you should be able to get the right flavor.